"41AN1-15, Burial E-3" by Timothy K. Perttula and Robert Z. Selden Jr.
DECORATION: The upper rim panel is plain, but the lower rim panel (defined by upper and lower horizontal engraved lines) has seven negative ovals or semi-circles. At the center of each oval or semi-circle are small negative circles defined by seven to 14 hatched triangles. The negative ovals or semi-circles are each divided from the other by two hour glass-shaped engraved elements with hatched triangles at their four corners. There is a white kaolin clay pigment rubbed in the engraved lines. Poynor Engraved, var. 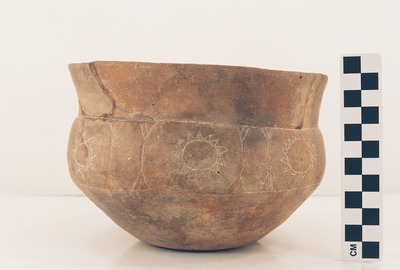 Lang compound bowl (Vessel 41AN1-15).